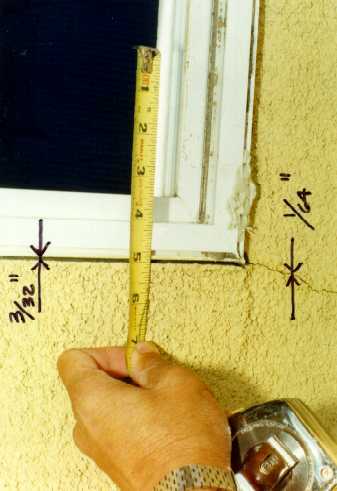 In a recent investigation by Interactive Resources of water intrusion into stucco walls, it appeared that the leak path was through an unusually large joint between the stucco and the frame of vinyl windows. The coefficient of thermal expansion of vinyl (PVC) is nearly four times that of aluminum and nearly 14 times that of wood. When used with stucco, which tends to shrink slightly as it cures, vinyl frames appear to contract sufficiently to provide a small but significant gap around window perimeters. Water intrusion into the gap may be sufficient to cause fairly quick degradation of paper-based weather-resistant barriers, resulting in wetting of framing and sheathing. Even when plastic or all-bitminous flashings are used, it appears that water intrusion can reach and deteriorate the surrounding paper-based weather resistant barriers. A similar gap occurs around aluminum and even wood windows, but it is so comparatively small that water intrusion is not typically a problem unless other flaws exist. It appears that the difference between aluminum and vinyl is enough to enable aluminum windows to function successfully while vinyl may not, even though the detailing and installation is the same. I read with great interest Interactive Resources’ article on Vinyl Windows in stucco facades. This pretty much corroborates what we have been saying for quite sometime. The problem we continue to encounter however is that if there is a problem around vinyl windows there is usually the accusatory “your stucco leaks”. Where in reality it is the window that has instigated the issue. Last year Marvin Windows was kind enough to let me into their facilities where we were able to test four panels. The windows used were all metal clad. On three panels we ran the stucco up to the window frames. On one of the panels we purposely stopped the stucco with a casing bead 3/8″ away from the window frame and filled the void with backer rod and sealant. Upon examination of the panels after a water test we found that we had very minimal traces of water at the interface of the stucco and the windows. On the panel with the backer rod and sealant we saw what little issue there was, actually moved to the interface of the stucco and the casing bead. Our conclusion was that backer rod and sealant was not necessary with the aluminum clads, however in qualifying this conclusion, the panels did not go through a severe Minnesota thermal change. In making several presentations on water intrusion over the past two years, I make it clear to my audience that vinyl extruded and vinyl clads are moving considerably more than the stucco around them and for this reason it is suggested that this movement be absorbed with a sealant joint. For your information I am attaching a report of our test that was featured in our latest newsletter. I have approached Andersen Windows with the same objective, and hope to make a proposal to them shortly. I would appreciate any new information on any of your investigative forensic work as relates to stucco and I would enjoy further discourse on the subject.